I made low-carb Christmas cookies for my husband but I’m still on an elimination diet trying to figure out what I’m allergic to. Chocolate, dairy, almonds, eggs, gluten, sugar, and foods that are high in Chromium (which includes almost everything, animal, vegetable, and mineral!) are off limits for now. This is the most innocent treat I could come up with that I could eat. I’ve only made it once, but it was very good. Directions: Line a 8- x 12-inch shallow pan with parchment paper or foil and place in refrigerator to chill. Melt the coconut oil, coconut manna, and cocoa butter together in the top of a double boiler over hot, but not boiling water. Add sweeteners, vanilla, and salt and stir until smooth. Stir in pecans and pour onto chilled pan in an even layer. Place in refrigerator until hardened. Break into irregular pieces. Candy will soften if left at room temperature for too long. *Coconut oil is liquid above 76 degrees and solid below. It is sometimes called coconut butter when it is in a solid state. Coconut manna or creamed coconut is to coconut what peanut butter is to peanuts. It is finely ground coconut flesh, not just the extracted fat. Instructions for making it yourself are easy to find online. I also found a YouTube video for making it in a high-speed blender, but haven’t tried it; I bought mine and it was much dryer than the one shown in the video. Makes about 12 ounces or 26 pieces, roughly 2- x 2-inches. Cocoa Butter, oconut, Pecans, White Chocolate Bark. Bookmark. Do you know how much a 1/3 cup of cocoa butter weighs? I have a bag of it in chunks and usually recipes give the weight. Thank you very much, this sounds interesting. I hope you find what is causing your allergic reactions. Thanks for the question. That should have been in the recipe. I posted on Christmas Eve after making it for the first time, so it was a rush job. Made this last week. Oh so good!!! I overcooked it a bit, but still good, tasted like brown sugar covered pecans, heavenly, thank you! Thank you, Anonymous, for letting me know that you enjoyed the recipe. It's comments like yours that keep me working! It is confusing, Margaret. Coconut Manna is ground up coconut meat, blended until it is smooth, just like peanut butter is ground up peanuts. But it is also sometimes called coconut butter or creamed coconut. It is confusing because regular coconut butter used to mean the fat from coconut when it is in its solid form, ie below 76%. When the temperature is over 76%, it is called coconut oil because it is liquid. If the container holds just the fat from coconut, it may be called coconut oil or butter. If it contains ground coconut meat, it may be called coconut butter, creamed coconut, or coconut manna. One way to tell is that the manna is usually more expensive. For this recipe you need 1/3 cup of each, so 2/3 cup total of coconut products. Hope this helps. You are most welcome, Margaret! Enjoy! 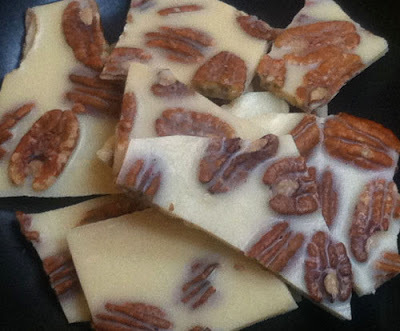 After seeing almond on this, I was sure to make this white chocolate pecan bark. Hi Lynn. I’m thinking of making a batch of these too! Hope you enjoy them.